Recently, in a Film & TV lecture, we were taken by a Production Designer who had worked on such shows like ‘Game of Thrones’. This excited me and it was an absolute pleasure of course. But what interested me is how she showed an example clip from ‘No Country for Old Men’, a real favourite film of mine. The scene in question is where Anton Chigurh enters a lonesome gas station and asks the owner the famous line “what’s the most you’ve ever lost in a coin toss?” The brilliance of Chigurgh’s character is that he intimates and overpowers every person he meets without having to do much and still manages to terrify you. Before, I believed this was just due to the marvellous Javier Bardem and his acting skills, but she proved me wrong. I won’t take away from Bardem, because of course, he was and is superior and the Oscar speaks for itself, but the character was shown even further with the attention to detail within the production design, mise-en-scene and placement of the scene. And this fascinated me, as film and it’s industry continues to do all the time. The attention to detail in this business is extraordinary and I truly believe some film professionals are some of the smartest, quick-witted people in the world. ‘No Country For Old Men’ has it all. If you like tasteful action and violence, it’s got it. If horror is your thing, it’s here. Ultimately, this is a thriller, but if it’s also films where the acting has to be phenomenal and the script is clever and witty that grab you, then this is definitely the film to watch. 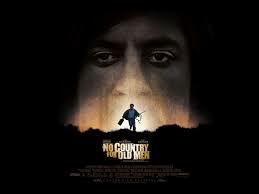 Adapted from Cormac McCarthy’s novel of the same name, ‘No Country for Old Men’ is directed and written by Cinema Masters the Coen Brothers, Joel and Ethan. It is, essentially, a cat-and-mouse game involving three men. Llewyn Moss (Josh Brolin), war vet turned welder and hunter, stumbles on a bloody scene-a drugs deal gone wrong. He leaves the drugs but leaves the scene with a bag of $2 million dollars. 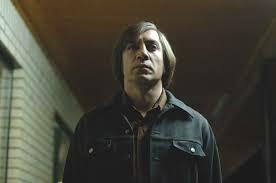 But, as you may expect, he is now a target to a ruthless, psychopathic hitman called Anton Chigurh, brilliantly played by Javier Bardem who won an Oscar for his portrayal of this truly chilling character. The third dragged in is Sheriff Ed Tom Bell (also excellent Tommy Lee Jones) who is hunting down both, to protect Moss and stop Chigurh. And all three are helped along by a great supporting cast including Kelly Macdonald and Woody Harrelson. With typical Coen twists and turns which will keep you at the edge of your seat in suspense- look out for the scenes in the motels, you really will have no nails left- lets you feel unsurprised that this won a Best Picture, Director and Adapted Screenplay Oscars as well as Supporting Actor, Javier Bardem, stealing the show. However, Tommy Lee Jones, for me, is ranked a close second, as the excellent script sees that he gets all the best lines, in particular, when his colleague asks at the start of the film “It’s a mess aint it Sheriff?” Jones replies “well if aint, it’ll do ‘til the mess gets here” and get there it does!